Generosity is a practice that measurably improves our life. The act of generosity is usually portrayed as giving material goods or money. The winter season is full of year-end appeals for donations, this being an important time of year for these funding drives. Marketing at this time of year encourages us to give lavishly to others and to ourselves, worry about the debt later. While we can distract ourselves, numb ourselves with material wealth, it ultimately doesn’t create happiness. The focus on generosity as an act of material giving leaves out a variety of opportunities to practice generosity. We can be generous with our time, from volunteering our time to taking a moment to listen to a friend who needs a kind ear. We can be generous when we choose to be compassionate and patient instead of giving into frustration when we deal with irritations we run into from day-to-day. We can choose to treat ourselves with kindness instead of listening to negative self-judgement. This month, I’m particularly getting to practice with that last one as I address some long overdue dental work. I’ve had some pretty terrible experiences with dentists in the past, including being repeatedly shamed for having anxiety. I also have an intersection of childhood trauma and dental work that makes the having dental treatment tremendously difficult for me. At the beginning of the month I had the whole 3.5 hour experience of having full x-rays taken, major cleaning, and an exam. It was exhausting and my tender gums are still not wanting anything crunchy in my mouth. After that, relatively endurable experience, and in order to really maximize the meager dental insurance benefit I have, I scheduled two crowns to be done the week before Christmas. That turned into a root canal, my first ever, followed by the crown later in the week. This means I’ve another crown, the dentist suspects a second root canal too, to plan in 2018. I also have a tooth with what look like an unusual, in that it is in a straight line, pattern of decay, that will be evaluated in mid-January by a specialist as it may well need removal and an implant. I’m trying to take this in stride and be both vocal, consistent, and transparent with my new oral care-providers; making sure they know exactly how I am doing with appointments, during and afterward, and just how severe my dental anxiety is, and why. With this added load of anxiety this month I’ve been focusing on keeping my energy up so I can teach my classes and connect with people I love. While teaching is tiring, it helps me to feel grounded and balanced; connecting with my students and clients truly lifts my spirits as well. I’m continuing to practice telling people I’m grateful instead of apologizing for what I see as personal failings, something I wrote about last month. I’m using my mindfulness practice to catch when anxiety is steering me into the dangerous shoals of negative self-judgement and shame, instead finding what might soothe my energy in that moment. I’m taking anxiety medication without getting caught up on some idea that I should be better at all this already; accepting that not everything can be “yoga’d” away, yet. 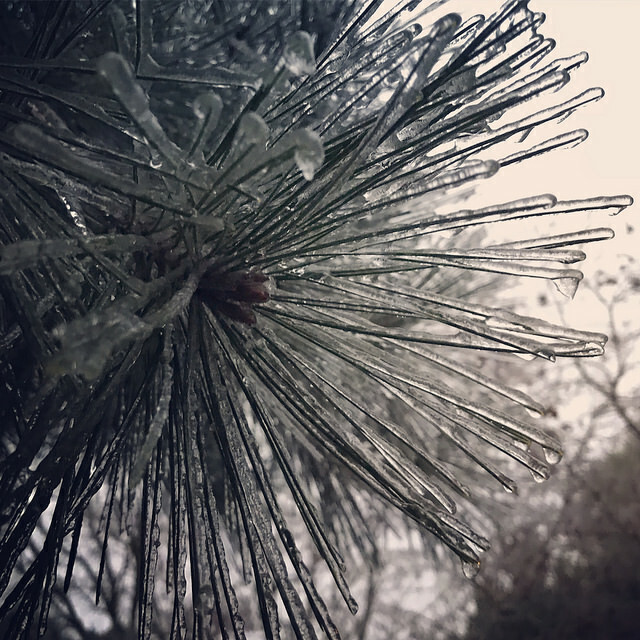 On Christmas Eve a storm arrived in the morning and we spent the day watching ice form on the plants and roads. We hunkered down, made lasagna together, and enjoyed one another’s company. We’re starting to invite people over again, but also keeping things a little smaller and more simple. Our New Year’s Eve was spent having dinner together and trying to stay up until midnight. We danced with the dogs wth the music on loud, so as to drown out the fireworks people were setting off, then went to bed. Looking forward to exploring more posts, more pictures of yoga, and podcasts in the coming year. I’ll personally be making more art and committing to the hard work to dismantle the shame I have around money and my body. Sounds like a great way to spend the holidays. That’s what we did on Christmas Eve. Then with the snow I cancelled our game day for safety. We made another big dinner and we’re very low key.